I first notice a sweet orange after opening the packet, but the spearmint takes over pretty quickly. Like… toothpaste. Orange gummy flavored toothpaste. It kinda smells the way those orange-mint filled chocolates taste. Refreshing. Sweet. This should be pretty good. …and it smells really good. It smells refreshing like a strong peppermint tea but also sweet in a soothing way. It tastes pretty good too. The spearmint dominates but the orangey sweetness mellows it out with help from the honeybush and rooibos. More mojito than marmalade. 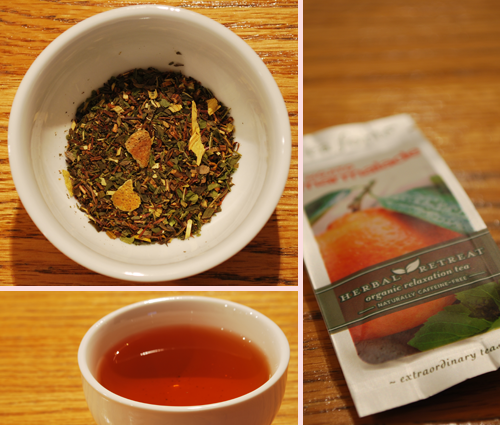 It’s both refreshing and sweet enough to satisfy – a decent dessert tea. However… I’d like to see what it tastes like with a peppermint/spearmint combo. I’d like a sharper, brighter mint. The mint/orange combo is good in general though. Tea Score: 83 – Tasty. Cupboard Score: 70 – I enjoy mint teas but I’d prefer peppermint over spearmint. I could see caving on this though.